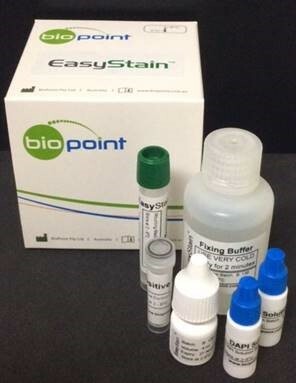 EasyStain™ is an immunofluorescent reagent that specifically binds to Cryptosporidium oocysts and Giardia cysts to highlight their presence in water samples. When a water sample is stained with the EasyStain™ reagent, oocysts or cysts in the sample will fluoresce bright green. Stained samples can be examined using fluorescence microscopy, flow cytometry or laser scanning cytometry. There are numerous organic particles present in water samples that can cross-react with most Cryptosporidium and Giardia-specific antibodies. This makes recognition difficult because these particles can easily be mistaken for Cryptosporidium oocysts or Giardia cysts, results of staining can be difficult to interpret. However EasyStain™ is formulated to avoid cross-reaction with particles present in water samples, ensuring that only the oocysts and cysts are stained. 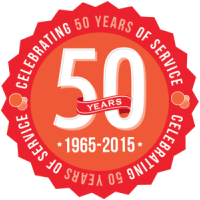 The antibodies in EasyStain™ are highly purified, ensuring that there is no contamination. The conjugated antibody is stored in a specially designed buffer that includes a novel blocking agent and a preservative. 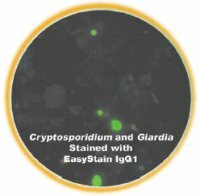 EasyStain™ is a mixture of two monoclonal antibodies; a Cryptosporidium-specific IgG1 mAb and a Giardia-specific IgG1 mAb. The reagent is supplied as a working solution and does not require dilution. A Wash Buffer - to wash excess antibody from slides or membranes. The Wash Buffer has been specially designed to increase fluorescence and reduce fading. A Positive Control - containing Cryptosporidium oocysts and Giardia cysts at a concentration of 200 to 400 per 50µl. Mounting Medium - to apply to the microscope slide before adding a coverslip. The Mounting Medium has been specially designed to reduce fading of the prepared sample.